Model NO. : X(S)N-3 x 32, X(S)N-5 x 32, X(S)N-10 x 32 etc. 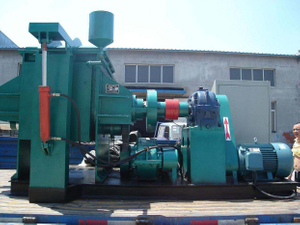 The machine is mainly used for plasticating and mixing of natural rubber, synthetic rubber, reclaimed rubber and plastics, and used in the mixing of various low glue degree materials. The machine is the most advance new type mixing equipment of rubber and plastics industry, each characteristic is so advanced as the same product of foreign. It furnished with reasonable designing, construction tightly packed, occupying small area, installing convenience, high efficiency of production, operating simply. It is easy for cleaning the mixing chamber and replacing color material, cooling & heating system is good, the mixing chamber adopts close construction. All these, the working environment is very good. Since new sealing designing, we get excellent result in sealing and everlasting.